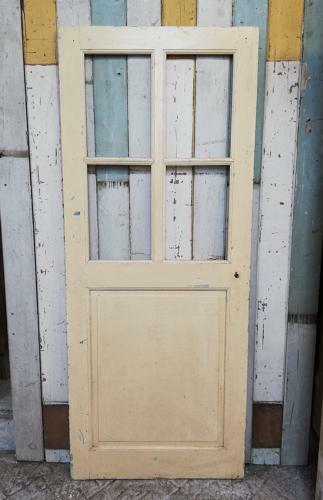 A small, sweet, French reclaimed internal pine door, painted pale yellow. The door has a lovely, character look with a rustic, country feel. The door has a large raised and fielded panel at the base and four rectangular panels above, ready for glazing. We can glaze the door for an EXTRA CHARGE, please contact us to discuss your requirements and for a quote. The door has a painted yellow finish at present but the door would benefit from stripping and refinishing. We can possibly strip the door, please contact us for further information. The door is reclaimed and therefore has some signs of use and wear. There are stains, marks and chips in the paintwork. There are some holes and slight damage where the door hardware has been removed. The pine has knocks and chips, especially to the edges and the top panel edges are uneven. The door height is slightly uneven. New hinges and hardware will need to be supplied by purchaser. The door is a lovely, petite item that has fantastic rustic charm, making it very desirable. We can strip the door for an extra £40 if wished. The width could be re-sized to 76cm if required without effecting the structural strength of the door.